The interruption of natural processes is the final blow for forests. The isolation of small pieces of nature which causes disruptions of the natural life cycles of not only animals but also plants is something that you see way too often on Curacao. The region of Banda Bou is relatively undeveloped compared with the city. However, if you take a good look at the the map of the island you see that Banda Bou is also pretty isolated from the rest of the natural environment. We, as inhabitants of Curaçao, have in fact divided the island into two isolated subareas. There is the nature area at Eastpoint, which is still relatively untouched, a fact which will probably belong to the past very soon if the government’s plans will be pushed forward. And then there is the area from Zegu to West Point, known by most as Banda Bou. The map shows that there really is no connection whatsoever anymore between the two areas. The airport in the central part of the island has effectively imposed a boundary which is uncrossable to natural elements. Two isolated areas have been created. 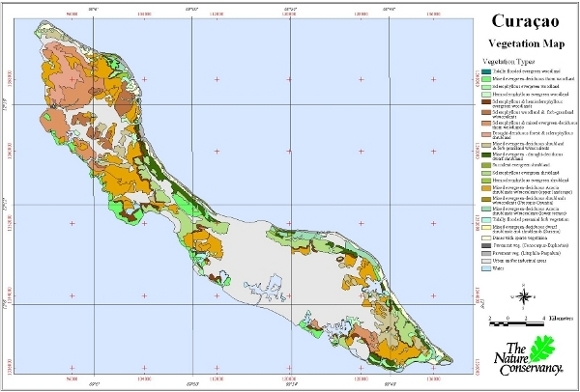 Vegetation Map of Curacao (www.severens.net). The large light grey spot in the middle represents the lack of vegetation groups and shows how the island is divided into two parts. Between West and East remained a number of small nature reserves like Rooi Rincon, the strip from there toward the Hato Caves, the Kabouterbos, the tiny Den Dunki and the top of the hill at Rooi Santu, the Seru di Seinpost. The nature area around the lagoon of Jan Thiel can also be counted, and maybe some gullies (locally known as rooien) and some small pieces of ‘mondi’ that are not developed yet. For birds, the long crossing from East to West may not be such a problem, although it has never actually been shown that birds do indeed travel from one side to the other. However, it has never been shown that this does not happen, either. But anyone can see that it is a lot more difficult for plants and other species. The Curacao white-tailed deer, a unique species, has died out at Banda Riba and survives only in Banda Bou. For some tree species spreading to ‘the other side’ will only be possible thanks to ‘unconscious’ human intervention. In fact, we are all responsible for dividing the natural environment of one island up into two separate islands. Biology refers to corridor areas. These are areas that serve as a sort of ‘stepping stones’ for plants and animals. A place where they can get to in order to be able to ‘jump’ to the next. What is important here is that the distances of one corridor area to the next spot should not be too far. If species start avoiding such an area as a hub to the next area because the distance has grown too large, it in fact loses its ecological value. The introduction of animal species from abroad such as the Red Palm Weevil (Rhynchophorus ferrugineus). Not only a danger to expensive foreign palm trees, but potentially also for the native Sabal palm (Sabal cf. causiarum), the only palm species that occurs naturally on the island. The fact that there still is an ‘island West’ and ‘island East’ is a small consolation. The situation becomes more dramatic when we realize that even within these two ‘islands’ there is fragmentation and isolation. It is an unfortunate fact that we, as islanders, are ‘developing’ our surroundings without even thinking about the consequences. We even managed to create isolated natural areas within the Banda Bou region. This makes the survival of the flora and fauna even more difficult. On the road map, the green areas are clearly distinguishable from the built-up parts of the island. There is not much undivided green left. In fact, you can compare nature and all the natural systems that operate within it with a very unique and expensive Persian rug. In its original form such a carpet is worth a fortune. I you would cut the carpet into pieces and sew it back together, you can do what you like, but would not get one penny for it. Even though you still have the same surface area and have a seemingly complete carpet. The same counts for nature. One unbroken, interconnected piece ‘works’. Cut it in pieces, and you can try to string as many parts together as you like, but your ‘Persian carpet’ is gone forever.